We are definitely in the holiday spirit around here and soon, one lucky reader will be too as I have a fabulous giveaway courtesy of the folks at Treetopia. Woohoo! A few weeks ago, Treetopia asked me to be a part of their Treetopia Design Council and offered me the tree of my choice. I hesitated for a moment - we already have an artificial green tree for our living room, and our house is small so did I really have the space for a second tree? I browsed through the Treetopia website and found they had a huge selection. 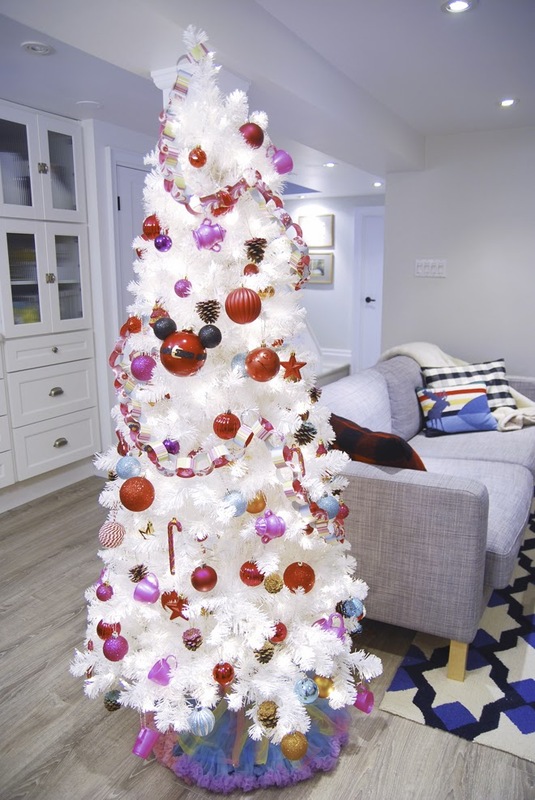 I've always wanted a white tree (my favourite Aunt had one in the 70's that she decorated in silver tinsel and blue ornaments. It was the coolest tree) so white it would be. The Basics White Tree at 6' tall and only 32" wide was just the right size to fit in our wee basement, between the end of our sofa and the craft table. 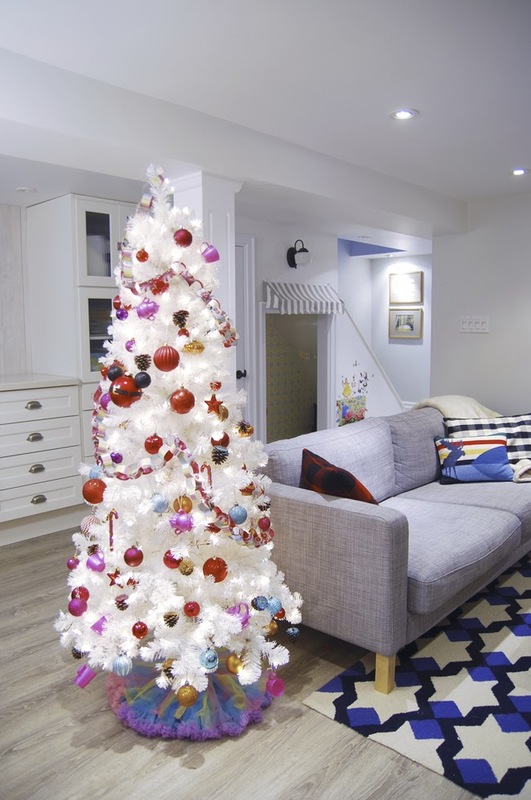 As a secondary tree, I wanted this one to be more of a "kid's tree" and go a little crazy with the decorating and pile it with bold colours and handmade crafts. That's the fun of having more than one tree to decorate, right? Chloe, her grandma, and I got our craft on and created glittered pine cones using Mod Podge and glitter. We also made paper chains from scrapbook paper and I strung up some of Chloe's plastic teapots and cups for a hint of pink and whimsy. I found a glittery shimmery white garland at the dollar store and tucked it between the branches to add a bit of sparkle. For the tree skirt, I used two of Chloe's rainbow coloured tutus. Easy and so cute! This tree makes me smile :) We spend a lot of time in the basement during the colder weather and now we have a reason to do some crafting. This tree is going to get a lot more decorated over the next few weeks! 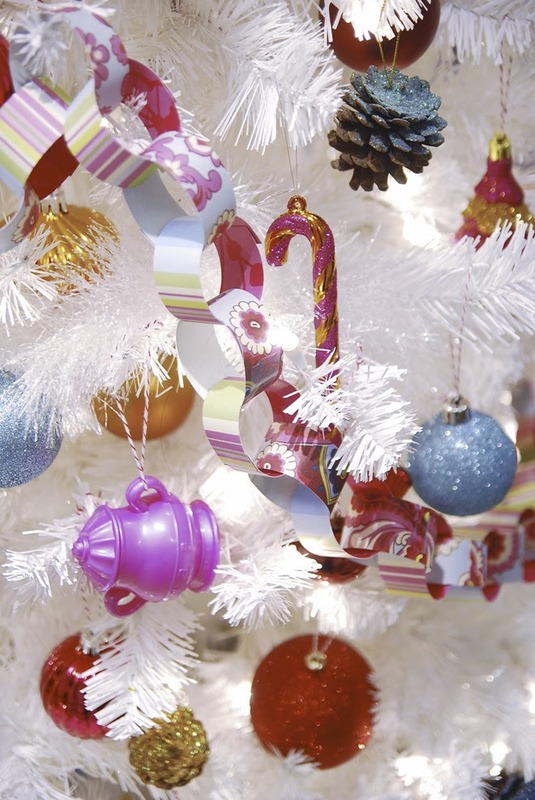 For more tree decorating inspiration, check out Treetopia on their Facebook page and on Pinterest. Ready to decorate your own tree? Then enter now to win a TREE, WREATH and GARLAND from Treetopia!